It's earnings season, and that means stock price volatility as investors digest their companies' latest quarterly numbers. 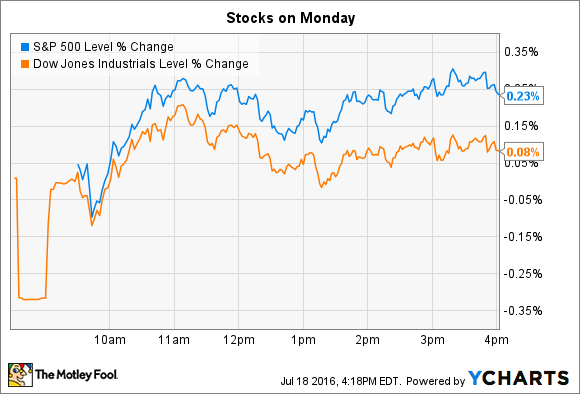 Stocks had a solid start to the trading week on Monday. The Dow Jones Industrial Average (DJINDICES:^DJI) added 16 points, or 0.1%, and the S&P 500 (SNPINDEX:^GSPC) gained 5 points, or 0.2%. Earnings season hits its peak over the next few weeks, as hundreds of the nation's biggest companies update investors on their second-quarter operating trends. Fresh quarterly reports drove big moves in Bank of America (NYSE:BAC) and Hasbro (NASDAQ:HAS) stocks on Monday. Bank of America rose 3% after posting surprisingly high second-quarter profits. The banking giant generated $4.2 billion of net income, or $0.36 per share. That marked a decline from the prior year's $0.43 per share, but it beat consensus estimates that were forecasting $0.33 per share of earnings and marked its third-best quarterly report by that metric in five years. Solid loan and deposit growth combined with lower operating expenses to push profitability higher for Bank of America's key consumer business. Meanwhile, its wealth-management, global-banking, and global-markets segments each contributed higher earnings despite the headwinds caused by low interest rates and falling equity prices. "We had another solid quarter in a challenging environment," CEO Brian Moynihan said in a press release. Those challenges were most glaring in Bank of America's interest income, which fell by $1 billion, year over year, to $9.2 billion. However, healthy growth in deposits and loans produced an uptick in adjusted interest income. "That, coupled with a relentless focus on costs, drove improved operating leverage across all four of our business segments," Chief Financial Officer Paul Donofrio explained. With profitability improving, Bank of America is positioning itself for an earnings spike when interest rates finally begin climbing again. In the meantime, its profits are gaining strength from a growing deposit base, lower costs, and improving credit quality. Hasbro posted the biggest decline among S&P 500 constituents following its Q2 earnings release. The headline numbers were strong, as sales, operating profit, and earnings all improved. Hasbro's licensed brands led the way higher. In particular, demand for Disney's (NYSE:DIS) Star Wars, Princess, and Frozen-branded toys and games pushed that segment up by 15%, compared with a 5% gain for company-owned brands such as Nerf and Play-Doh. Hasbro squeezed more profit out of those sales gains as well. Operating margin rose to 9.7% of revenue from 9.5% a year ago. The company is reaping the financial rewards from its success at "driving strong consumer and retailer demand for our brands globally," CEO Brian Goldner said in a press release. Operating profit (in millions) was up 12% in Q2 and 32% through the first half of the year. Image source: Hasbro investor presentation. The Q2 results were held back by a growth slowdown in the boys category, though. That segment ticked up by just 4%, compared with a 24% spike in Q1. Inventories also ballooned in the quarter, spiking higher by almost 50%. In a conference call with investors, executives explained that nearly all of that increase can be tied to products that are new to Hasbro's portfolio such as the Disney Princess line and Star Wars merchandise. Still, shareholders will want to see those inventory levels trend lower as we approach the critical holiday shopping season.